I’m just going to be upfront about this: Rockshow, shot in 1976 but not released theatrically until 1980, put a very broad smile on my face from start to finish. That is, except for the times my jaw dropped due to the sheer awesomeness of Paul McCartney’s vocals. 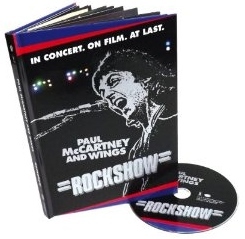 Until now unavailable (legally) on any format except Betamax and laserdisc, Rockshow has been expanded to its glorious 129 minute running time and remastered for Blu-ray and DVD. Numerous songs that had been edited out of previous editions have been restored. 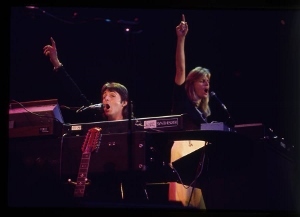 This is a composite of shows from Paul McCartney and Wings’ celebrated 1976 tour, with songs taken from shows in New York, Los Angeles, and the legendary Kingdome show in Seattle. This was an era when McCartney could stage an entire concert without having to rely on Beatles songs, at least not many. There are five here, including an uptempo rendition of “Lady Madonna” that boasts a fun reprise (spontaneous sounding, especially since it’s not on the Wings Over America album version). Speaking of that triple live album (recently reissued), it’s important to note that the versions heard in the film are all different performances. It’s no secret that studio overdubs were added to the live tracks to prep the film for release. Some sweetening was done on the live album, too. I guess only those with access to soundboard bootlegs of the exact takes selected for the film have a chance to truly scrutinize for differences. Laine, who proves to be a reliable utility man (playing various guitars, bass, keys, and even a touch of harmonica), first steps forth on “Spirits of Ancient Egypt.” In fact, those back-to-back numbers come early in the set and represent probably the only bit of flawed pacing to be found. Two non-Macca tracks only four songs into the show? Weird choice, but maybe he felt it was necessary to cue the audience right away that he wasn’t going to be the center of attention the whole way through. After all, McCartney’s vision for Wings was for it to function as a true band, despite the frequent lineup changes. Versatility abounds, ranging from the ‘30s-style pop of “You Gave Me the Answer” to heavy thumpers like “Letting Go” and Denny Laine’s “Time to Hide” (always a highlight of Speed of Sound, but even better here). The pyrotechnics and lasers of “Live and Let Die” look downright primitive compared to the extravaganzas audiences see these days during that song. The four-piece horn section adds immeasurably to the proceedings (Thaddeus Richard occasionally steals the show with his terrific soprano sax soloing). McCartney is in prime form, visibly ecstatic most of the time as he throws everything he has into the performance. Not relying on Beatles material even for the two encores, he and the band rock out on “Hi, Hi, Hi” and a song whose studio version has yet to surface commercially even today: “Soily.” It’s safe to assume most of the audience was unfamiliar with this slab of hard rock (scoff if you must, but to my ears this is authentic rock), yet it brings the house down just the same. Rockshow has been remastered from the original 35mm negatives and remixed in 5.1 DTS-HD MA surround sound. It’s framed at 1.78:1, presumably approximating the framing of the original theatrical release. The transfer is very good considering the inconsistencies of the source materials. This was 1976 and shooting film in a dark, cavernous arena simply did not produce the same results as what we’re accustomed to today. Some footage is startlingly sharp, while other shots (especially medium and wide shots) are soft to varying degrees. The lighting is kind of drab and dull by modern standards, but it’s never difficult to see exactly what the musicians are doing. The 5.1 DTS-HD Master Audio soundtrack is killer. McCartney’s vocals sound great, with a little variation in fidelity amongst the many songs. On “Maybe I’m Amazed,” for example, his voice sounds just a tad overdriven. I’m guessing minor issues like this, rare though they are, stem from issues with the source recordings rather than any mastering error. The bass sounds deep and resonant, as do the drums. The surrounds are basically filled with audience noise, the levels of which, of course, reflects the audience’s enthusiasm for whatever’s going on at a particular moment. Don’t expect much out of the single special feature. There’s a ten minute featurette called “A Very Lovely Party,” essentially several minutes of behind-the-scenes footage (mostly silent) and some fan reactions filmed as audiences were exiting. Included among this is some footage of Dan Aykroyd onstage, as well as John Belushi doing his Joe Cocker impersonation (sadly without audio). Looked like some sort of private event (of which I wish we could’ve seen more). The disc is stored in a cardboard pocket in the back of the digibook package. A new essay by Paul Gambaccini is included in the book. Needless to say, Rockshow is heartily recommended to all McCartney fans. It is hard for me to believe that it has been since 1976!! I was in my early teens then and I remember it well. How could you forget Paul once you have heard him? I am glad that this is now available “legally”. Though my son considers his music the “classics”, I still just think of him as “Paul”, one of my longest crushes!